RawFusion is renowned for its delicious and nutritious plant-based, vegan-approved protein used extensively by demanding people from all walks of life. Now that RawFusion protein is Non-GMO Project Verified, consumers can rest assured knowing this premium protein is produced in compliance with the Non-GMO Project Standard. With our dedication to producing plant-based products that promote good health for our customers and sustainability for the environment, we want to ensure our customers know exactly what's in their food. RawFusion announces Non-GMO Project Verification for all flavors of their renowned plant-based RawFusion protein. RawFusion is dedicated to producing only the best plant-based protein products, and that means taking every step possible to ensure premium quality throughout the production process. 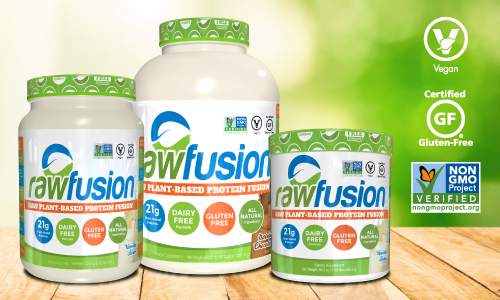 All products are vegan-approved, third-party gluten-free audited, NSF-GMP-certified, and packaged with 100% post-consumer recycled plastics, and RawFusion protein is now Non-GMO Project Verified. 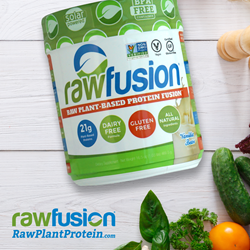 "We produce only plant-based products we use ourselves and are happy to share with family and friends, and we believe in full transparency of our ingredients," says Jonathan Lawson, RawFusion's E-Commerce Marketing Manager. "With our dedication to producing plant-based products that promote good health for our customers and sustainability for the environment, we want to ensure our customers know exactly what's in their food. "GMOs have never been fully tested for human safety, and over 60 countries worldwide, including all of the European Union, have either restricted or fully banned GMOs. That's why we're proud to announce our Non-GMO Project third-party verification." RawFusion protein is ideal for people from all walks of life, from athletes to time-constrained meal planners-vegans and non-vegans alike. With only whole food, plant-based ingredients, you get premium-quality protein and balanced nutrition. Now that RawFusion protein is Non-GMO Project Verified, customers can rest assured that RawFusion protein is produced in compliance with the Non-GMO Project Standard, which includes ongoing testing of all major high-risk ingredients. RawFusion is dedicated to providing bio-fermented plant-based nutritional products that have a positive effect on your health while promoting environmental sustainability through meticulous ingredient sourcing, producing, and packaging. RawFusion goes above and beyond to put the health of people and the planet before profits.